The San Fermin fiestas officially end on the 14th July. The people from Pamplona gather in front of the town hall balcony and solemnly end the eight days of festivities just experienced. At twelve midnight a mass of lit candles are sadly waved after the mayor has announced the end of the fiestas. The song which has given its name to this final act will be sung throughout the night: "Pobre de mí, pobre de mí, que se han "acabao" las fiestas de San Fermín” (Poor old me, poor old me, the San Fermin fiestas have ended). Despite this, the celebrations continue until dawn. The start and end of the San Fermin fiestas are celebrated at the same place, with the same protagonists and at the same hour. However the "Pobre de Mi" is the very antithesis of the Chupinazo in which the rocket is fired to mark the start of the fiestas. Now it is night instead of day, sadness instead of gaiety, accumulated tiredness instead of a desire to have fun. As on the 6th July, a crowd of people concentrate in the Town hall square shortly before midnight. At 12 o'clock on the dot, the mayor appears on the balcony to end the fiestas and, addressing the people, he declares: "There's not long to go before the glorious fiesta of San Fermin" and he urges everyone to take part in the San Fermin fiestas of the following year. The crowd then sings the "Pobre de Mí" whilst hundreds of candles are lit to illuminate the darkness of the night. The custom is then for everyone to take off their red scarves as a sign that the fiestas are officially over. From the adjoining Plaza de los Burgos square, a series of rockets are set off to mark the end of the fiestas. The people from Pamplona must then get used to the idea of returning to normality. Many will continue with the fiestas for a few more hours before finally taking off their red scarves. Tips: To fully participate in the Pobre de Mi, you need to have a candle. If you forget to bring one, you can buy one on the street, as you get closer to the Town hall. Once there, let yourself be moved by the atmosphere and sing an emotive “Pobre de mí”, together with the “ya falta menos” (there's not long to go) and other songs marking the end of the fiestas. 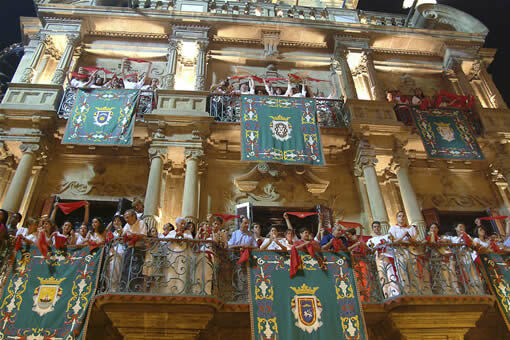 As an alternative to the official act, the Peñas hold their own particular fiesta in the Plaza del Castillo square. They are easily distinguished by their banners and their members dancing to the bands. Given the fact that, at this time, there are few bars open to allow you to continue festivities, the "Pobre de Mi" of the Peñas is a good opportunity for prolonging the evening. A third point of encounter is the Plaza del Consejo square, although this does not appear in the official program. 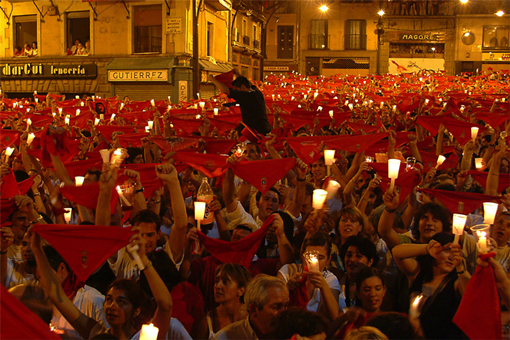 For the last 26 years the end of the fiestas has been celebrated here with considerable success, with hundreds of persons coming to this square to sing and dance, holding their red scarves in the air. The members of the El Chanclazo Peña were the first to come to this square on the last night of San Fermines and they come there ever since.